S-Adenosylhomocysteine (SAH) ELISA Kit | Cell Biolabs, Inc.
S-adenosylhomocysteine (SAH) is generated through the donation of a methyl group from S-adenosylmethionine (SAM) to various biomolecules. SAH is then hydrolyzed to homocysteine and adenosine, which is converted to methionine, and ultimately back to SAM. SAH can act as a methylation inhibitor, therefore the SAM/SAH ratio, or methylation potential, is important for maintaining proper methylation in the cell. Our S-adenosylhomocysteine (SAH) ELISA is designed for detection and quantitation of SAH in plasma, serum, lysates, or biological fluid samples. 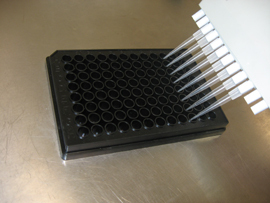 This assay is a competitive ELISA where samples and an anti-SAH antibody are added to a plate coated with a SAH conjugate. The sample and conjugate compete for antibody binding, which generates a reverse curve. Samples with high SAH levels will bind the majority of the antibody, which gets washed away and results in a low OD, while samples with low SAH levels will leave more antibody available to bind to the conjugate, producing a high signal. Weinstock, N. I. et al. (2016). Metabolic profiling reveals biochemical pathways and potential biomarkers associated with the pathogenesis of Krabbe disease. J Neurosci Res. 94:1094-1107.